We are having an awesome time in Japan, but I wanted to take a few minutes to post a quick peek (don’t worry, more detailed posts and LOTS more pictures will come later). Crowded shops have so much character! Shops, shops, everywhere! Akihabara is full of stimulation, all enticing you to buy more. Their stores are tight and packed to the brim, every space utilized. Even the stairs are just a surface upon which to advertise more. With so much to look at, it’s easy to get lost simply wandering from store to store. We’re staying here, so it’s easy for us to take it in small doses, but it’s certainly worth a stop when visiting Tokyo! 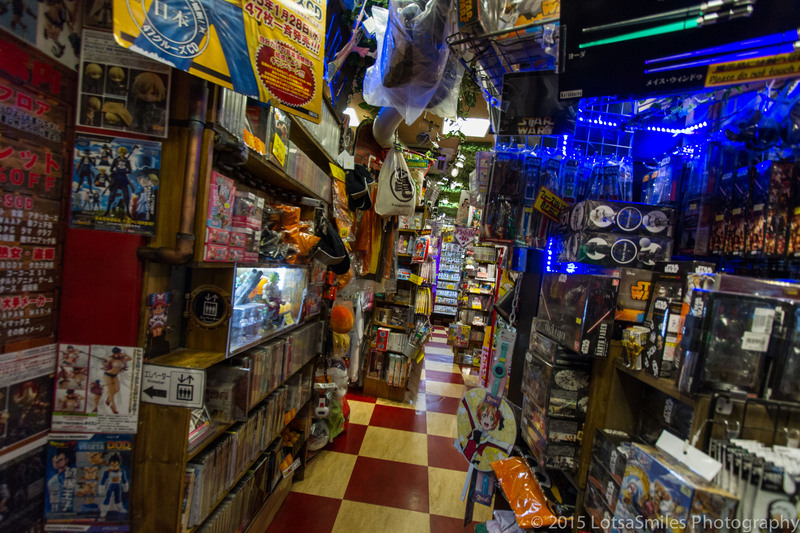 It is certainly *the* place for souvenir shopping, anime/manga, and character-packed shops. It was a great way to pass a particularly rainy day during our stay.